I really hope the Cinnamon helps - i love how the pills smell! lol. As I stated in my last blog, I want to workout STTS and I figured, yesterday - why not start then? So yesterday, being Thursday - I went and did an upper body resistance training workout along with 20 minutes of cardio. I'm also NOT TOUCHING THAT SCALE! 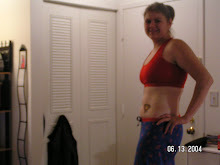 Which is REALLY hard because my pants are getting VERY loose :) but I will NOT get on that scale until March 1st. that's all for now! lataz!